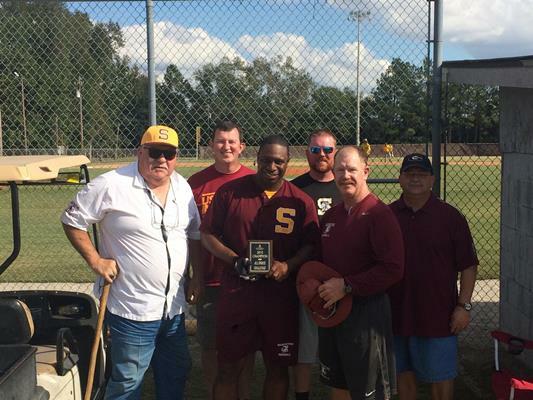 Pictured center is Salk baseball alum Antonio Evans who won the Salk All Sports Challenge at Alumni Day Oct 24. Both current players and alumni were invited to compete in challenges from softball, baseball and soccer. Pictured with him left to right are former Salk baseball coach Jess Dannelly, Salk student activities director Rob Brendle, Salk softball coach Kenneth Bellamy, Salk baseball coach Bubba Dorman and Salk baseball alum Walter Banks.